MPH workers, who are responsible for health training, teaching, supervision and administration of the hospital, are demanding better appraisals for their work. The protest of Multi-Purpose Health Workers (MPHW) across Haryana continues despite the state government’s attempts to suppress the struggle. MPH workers, under the banner of Multi-Purpose Health Workers’ Association (MPHWA), have been on an indefinite strike since August 27 raising various demands. “The main demands are- give technical status for the post of MPH workers, implement the grade pay of Rs. 4,200, enforce uniform allowance for the employees of Reproductive and Child Health (RCH), and reintroduce additional honorarium of Rs. 2,090, Rs. 3,000 and Rs. 4,000 for RCH workers with immediate effect,” said Surekha, a member of the Centre for Indian Trade Unions (CITU) who works closely with the health workers in the state. MPH workers serve the first and foremost step in the nursing profession. The role of MPH workers includes health training, teaching, supervision and administration of the hospital, and the promotion of health programmes in the community. Meanwhile, the BJP-led state government on August 29 had invoked the Essential Services Maintenance Act, 1974 (ESMA), for six months. Certain provisions under ESMA were intended to end the ongoing strike of the health workers in the state. ESMA also intended to stop the transport workers from the proposed strike. The transport workers, however, took to streets on September 5 raising their demands. Following this, on the night of September 6, Haisar district registered a case against 11 MPHW union leaders and an Auxiliary Nurse Midwife (ANM) under ESMA. “In Kaithal district alone, more than 300 MPH workers from 143 sub-health centers have been protesting. We will not be afraid of the black laws like ESMA. We will continue our struggle till our demands are met,” said Joginder Singh, district head of the MPHWA. 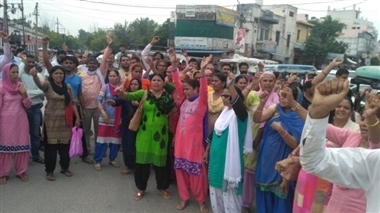 “Though in some districts, the protesting RCH workers have received notices from the authorities seeking an explanation, we will not step back from our struggle and we will give an apt reply to conspiracies that intend to weaken our movement,” said RCH employees’ union leaders Sushma Rana, Basanti Devi Sivan Kanta, Kusum Pundari, Kamlesh Devi, Sumitra Devi Rajond, Jagjit Kaur, Sunita Gihla, Indira Devi and Sarla Kaul, while addressing the employees jointly. “MPH workers commonly work with ASHA workers. However, they are more trained and therefore, come under higher grades than ASHA workers,” added Surekha. Recently, the ASHA workers had received a very small wage hike from the central government, but their demand to be identified as ‘workers’ remained unheeded.